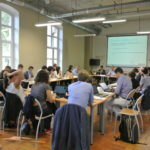 The second legal workshop served for discussions on the latest developments in the field of EMU. Furthermore, the presentations of the legal foundations and preconditions in the EU member states were continued. Legal experts of France, the Netherlands, Luxembourg, Belgium, Poland, Germany and the Czech Republic presented their constitutional systems in regard of the fiscal, economic and monetary integration.